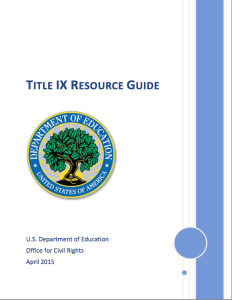 The U.S. Department of Education Office of Civil Rights has released a new guidance package on Title IX coordinators. There are over 90 Title IX complaints about mishandling of campus sexual assault open against colleges and universities across the country. But Title IX isn’t just for colleges and universities, and it isn’t just about response to sexual assault. Every US college, university, and school district — that includes K-12 schools– that receives federal financial assistance has to have at least one employee who coordinates Title IX compliance. This package helps clarify that coordinator’s roles and responsibilities, as well as ways that schools should support the work of their Title IX coordinators. And part of comprehensive prevention is reducing institutional and community tolerance for sexual violence, which is part of the charge of Title IX. The package includes details about the scope and administrative requirements of Title IX, as well as recommendations and discussion of key related issues. It urges institutions to do as much as possible to eliminate conflicts of interest for Title IX coordinators, and to support Title IX coordinators through promoting their visibility and providing for their training. Hopefully, this resource packaged will help Title IX coordinators be more effective in their work to ensure that sexual harassment and violence are not tolerated in our schools.